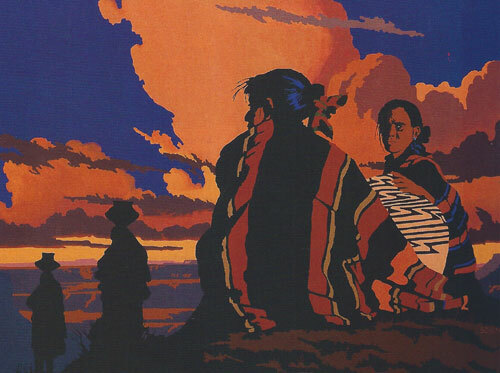 In a earlier SHARDS post I introduced one of my new summer online workshops for Artful Gathering ( an art “camp” for artists, teachers and students) called Southwestern Stripes: Serapes and Sunsets. 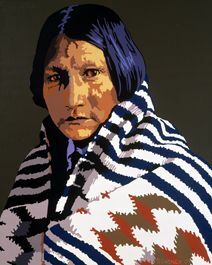 In the workshop, I teach the AG students how to use classic stripes and geometrics inspired by Navajo weavings and Pendleton blankets as inspiration in their paintings and mixed-media art. 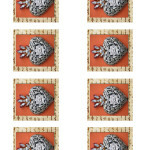 Outtake 2 – Southwest Stripes for Artful Gathering from Lyn Belisle on Vimeo. As usual, the students are exceeding my expectations. The class still has almost three weeks to go, and they are already producing some impressive work. Boy, is that true about seeing serape patterns everywhere – I am paying a lot more attention to serape designs since I started teaching this class. Wouldn’t you know it, the new Warhol/Schenck Exhibit at the Briscoe Museum here in San Antonio has a ton of them! Here’s the info about the exhibit if you’re in San Antonio and want to see this and some fine Warhol prints as well. 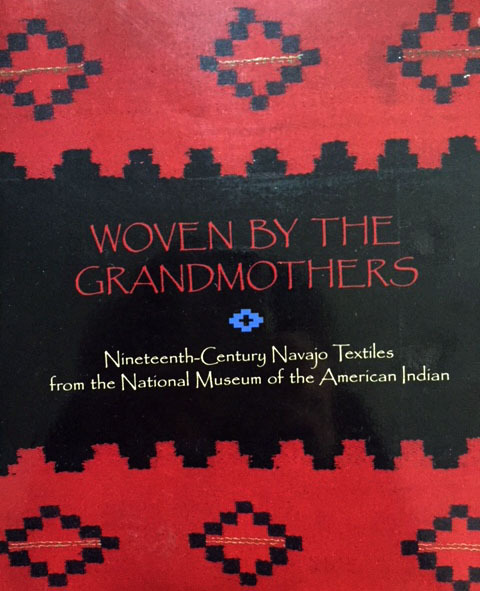 And to add more stripes to the serape story, I just found this beautiful book for $1.00 at the Central Library BookCellar used book store. 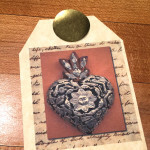 If you want even more Southwestern inspiration, My second Artful Gathering class, Neo-Santos: Creating Personal Spirit Guardians, opens on July 16th. What was that old commercial about “Yikes! Stripes!”? – there is, and always will be, something fascinating about woven striped serapes and the Southwest. They found their wings. . . I showed you the construction process in my last post, but what the students brought to it was the intangible sense of self. 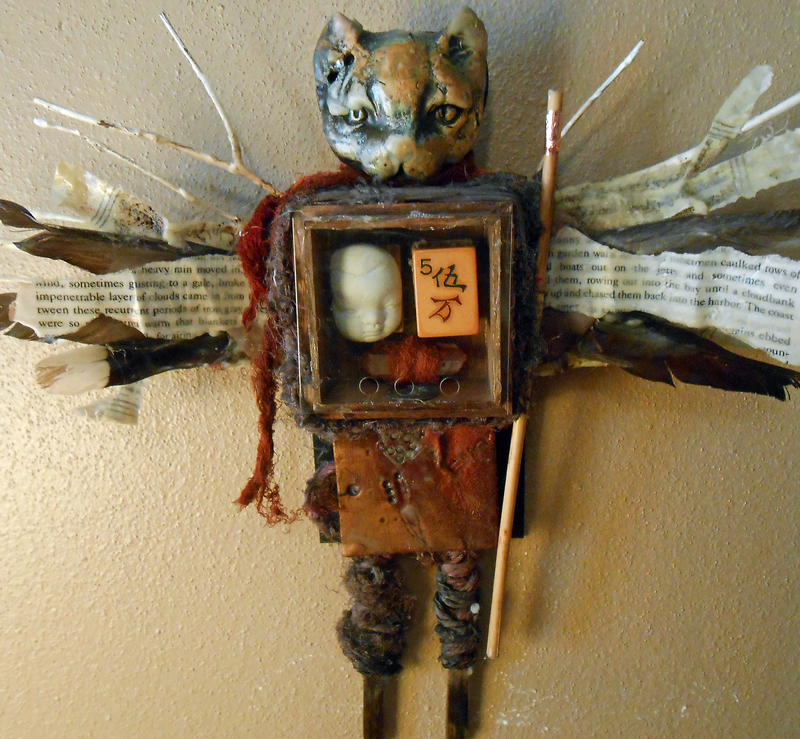 The idea of the NeoSanto is to interpret the traditional “santo” figure from the Southwest into a personal guardian. What resulted was one of the most meaningful art-making sessions and discussions that I can remember. I was honored to be there! Take a look at their work in the video, below. This may be the subject of the next workshop eBook! Many thanks to DeeDee, Pam, Robin, Marilyn and Lily for the amazing workshop synergy and generosity of spirit. Up next – on to Artful Gathering! Meet me there in our virtual classroom – registration is open. Saying goodbye to this San Antonio icon and artist is so hard. Brother Cletus died yesterday. 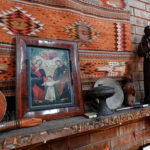 Cletus Behlmann, S.M., a Marianist Brother, taught for 19 years before arriving in San Antonio to become a full time artist. 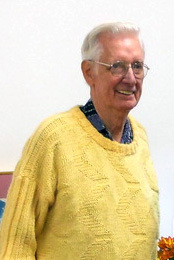 He settled in San Antonio in 1977 and began operating the St. Mary’s University Art Center. He captured the heart of the city in his painting and in his personal life with his affable, self-effacing wit and generous spirit. Those of us who were lucky enough to know him were blessed, but his work speaks to everybody through joyous color and dancing line. Knock knock. Who’s there. Oh, it’s YOU! C’mon in! I was just rearranging stuff in the chaotic collage that’s the house I live in. Calling all of this a “collection” dignifies it with more organization than it deserves. 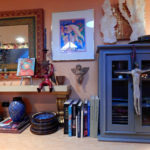 But I do like to find little objects that enhance the art from friends which graces my home. As artists (and really, we all are) we notice and respond to our surroundings. I love the concept of home as collage – ever-changing and shifting, always a new composition to inspire us.. 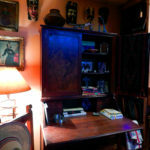 Recently I brought home a beautiful armoire that had been at the Studio. It belonged to my stepmother, and I cherish it, but the construction on the wall next door (right behind it) made me nervous. I found a perfect place for it here at home, and that inspired me to mix up other things, old stuff new configuration. Since you’re here, look around at some of my motley assortment. 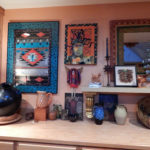 I love folk art, friends art, funky art. It’s definitely not about price tags, but it is about curated choices. (If you can’t see the photos, click on the title of this post). A=Alignment – have objects face each other within a group. For example if you have a wall-hanging with a crescent moon on it that you’re hanging next to a portrait, have the crescent and the face looking at each other. Makes sense? Then add a smaller object underneath that faces out. B=Breathing Room – yeah, I know. When you look at my stuff, there’s not much of that. But there are spaces between groupings so that you concentrate on one group at a time. And there are lots of clear, uncluttered surfaces. You can put up as much stuff as you want, but keep some breathing room, however small, between groups of stuff. Mirrors help, because they provide an illusion of depth and space. #3s = Three and Thirds – Groups of threes are so wonderful – if you add a fourth object, it ceases to be a group and looks like four separate things next to each other. But three object create a dialog. Try it. Here’s a link to a post that expands that idea. 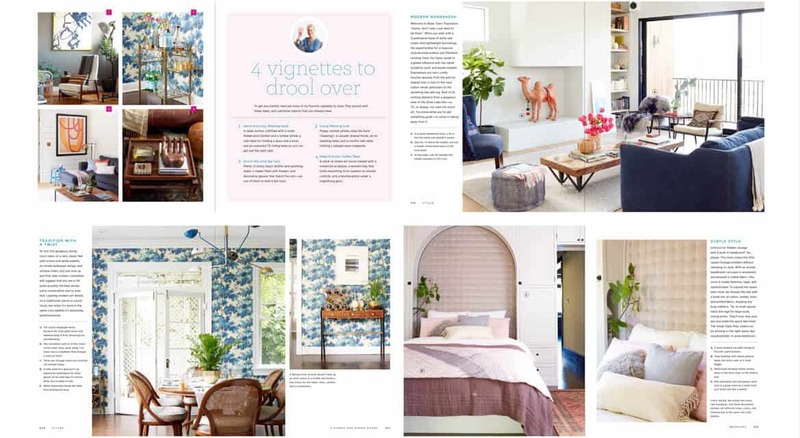 I just got a fantastic book called STYLED by Emily Henderson that has a ton of examples on how to build groupings in your “home collage.” It’s a treat to look at the photos. Not everything is going to be your style, but I did enjoy the book. It’s a guide to another kind of collage – the kind we live in. Happy weekend rearranging stuff! Wow. Just wow. I can’t believe I’ve lived this long without knowing about HAND/EYE online magazine (it comes in a print edition, too). 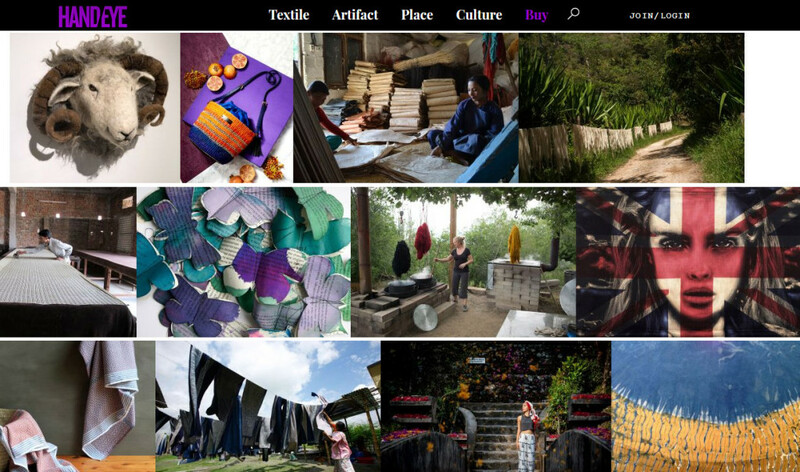 I’ve just created an account (free) and am browsing through gallery after gallery of textiles, artifacts, fine crafts, indigenous processes, and so much more. 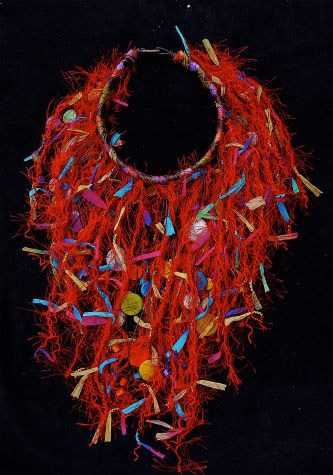 Maria Constanza Cardenas – Plumage choker, Orinoco collection. This piece portrays the power of the colors, textures, shapes and movement of the tropics. The online site is divided into sections and the emphasis is on celebrating cultural creativity and sustainability. HAND/EYE also features events such as England’s Woolfest as well as unusual products from small commercial designers such as 502 Home’s huipil-inspired ceramics. A personal favorite is an article written by India Flint in 2010 called Desert Country: Contemporary Aboriginal Artists Take on the Land. 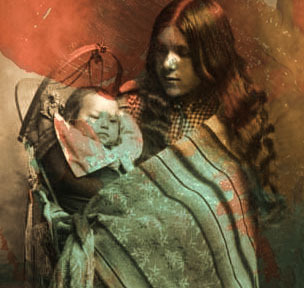 One of the most wonderful features of the HAND/EYE site is the treasure-trove of archived articles and galleries like that one written by India Flint with beautiful photographs – and they are organized beautifully to allow maximum accessibility. 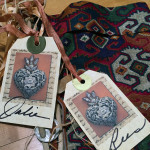 They also have a Facebook page if you just want a sneak preview! I commend this publication for its vision. HAND/EYE Magazine bridges the worlds of art, design, craft, philanthropy, retailing, and socio-environmental sustainability. That’s my Show and Tell for the week! Don’t forget that there will be an in-person Show and Tell at the Studio this Saturday from 2-4. 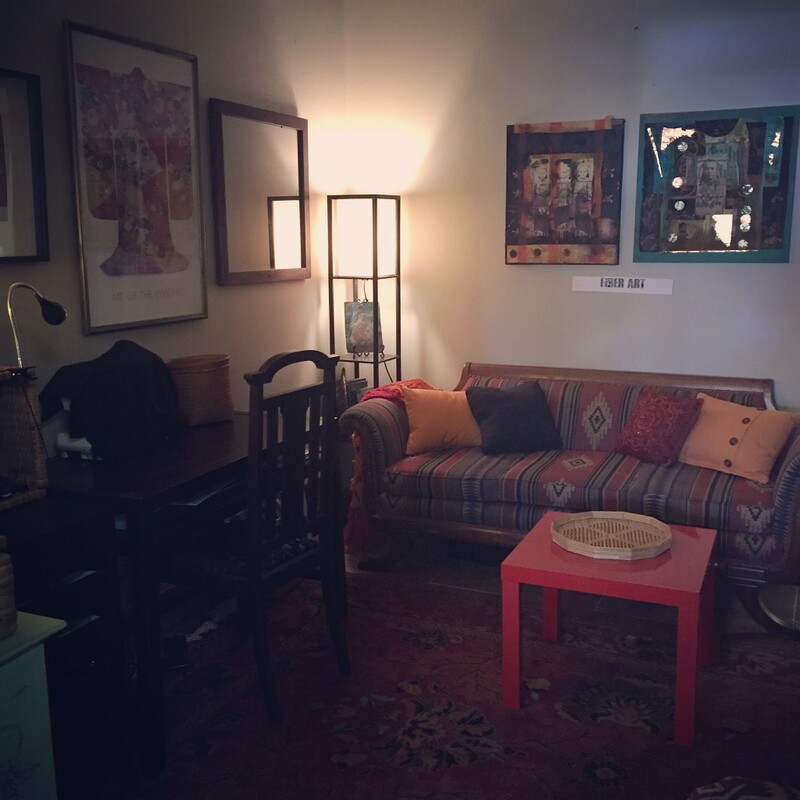 I just cleaned up my fiber art room and it looks great, so show up and don’t make me do this clean-up for nothin’ – :). Check it out (below) – it may be the last time you ever see it this organized. 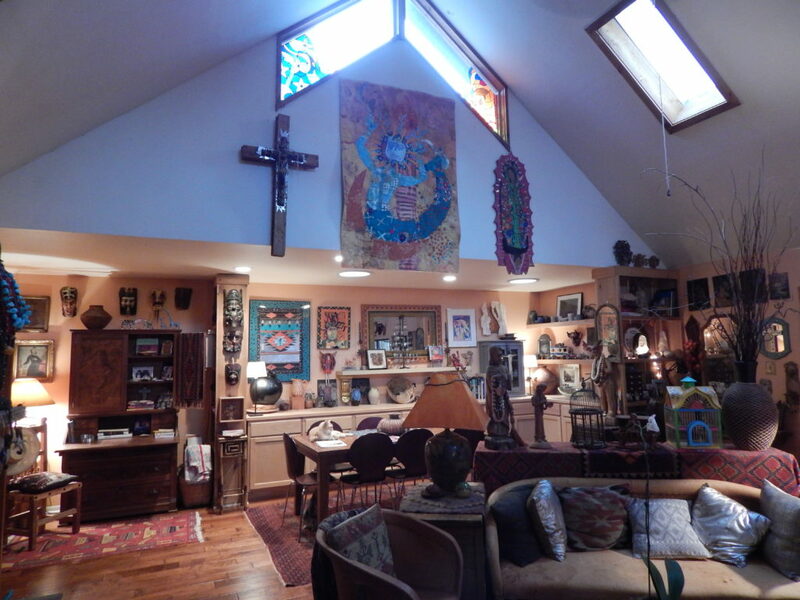 Like a lot of families, mine is quite – er, eclectic when it comes to ritual and celebration. We are a motley crew of every spiritual persuasion (or none), so I try to design gift tags and cards for us that reflect that diversity through symbolic neutrality. 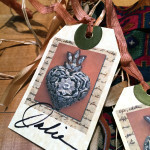 These little milagro heart tags fit the bill – folk arty but not specifically religious. 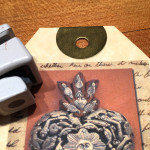 If you want to use them, too, here’s a link to a sheet of eight tags that you can print out on card stock, fold, cut apart, trim the corners, and punch. 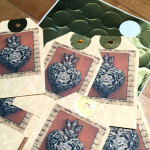 You will need a sheet of round gold stickers. This is optional, but looks cool. 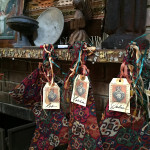 Tags hanging on stockings hung by the chimney with care . . . I used some parchment-colored card stock, but you could use any tag-weight paper that will go through your inkjet printer. The punched out gold circle adds a glitzy, industrial touch. 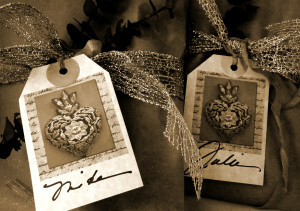 Email me if you have any questions, but these tags are sooooo easy to put together. Quick, too! 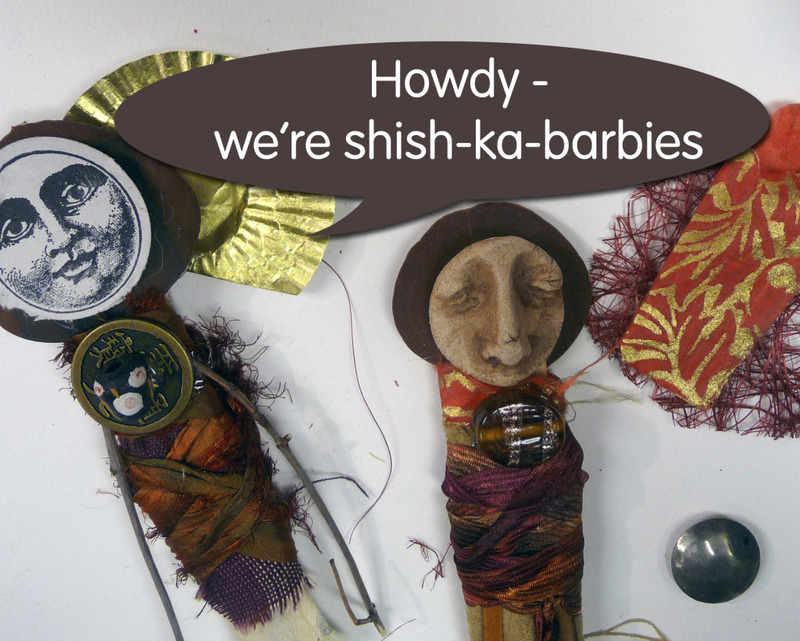 It’s the Shish-ka-barbies – – run away! What happens when I’m back home in the little studio on a cold, rainy day and I’m procrastinating about a jillion things, including making my New Year’s resolutions? I channel my inner Craft-Mama-Goddess and make Shish-ka-Barbie dolls instead! But wait, there’s more – I’ll be giving away these guys as the first Friday Freebie of 2015, so stay tuned. Bye for now – hope you’re looking forward to a very Happy New Year! OK, so I’m rather taken with cats. Or taken by cats. Whatever. 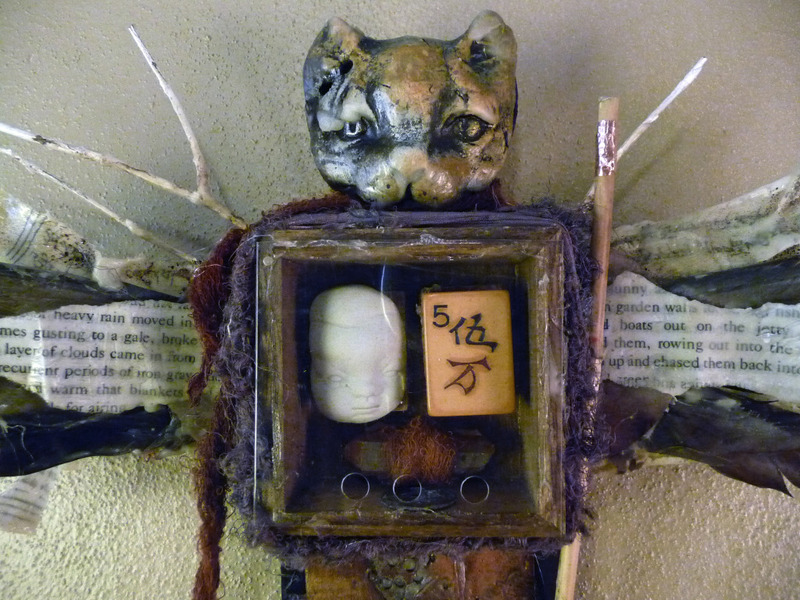 But some of the most enjoyable small art pieces I’ve done lately are cat spirit figures – sorta like Spirit Dolls with cat heads. As part of this, I’ve been informally researching cats in mythology – they have been around a long time and have always been considered pretty weird and magical. For example, did you know that Ceridwen, the Welsh goddess of wisdom, was attended by white cats who carried out her orders on Earth? Or that, in Islam tradition, dogs are considered unclean, but cats – who frequently bury their own waste and rarely eat another animal’s feces – are not. I like that “rarely” part – I mean, a cat’s gonna do what a cat’s gonna do. 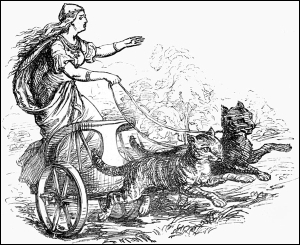 My new favorite cat story is about Freya, the Norse goddess of love and fertility and the wife of Odr (who disappeared right after they got married, but that’s another story). 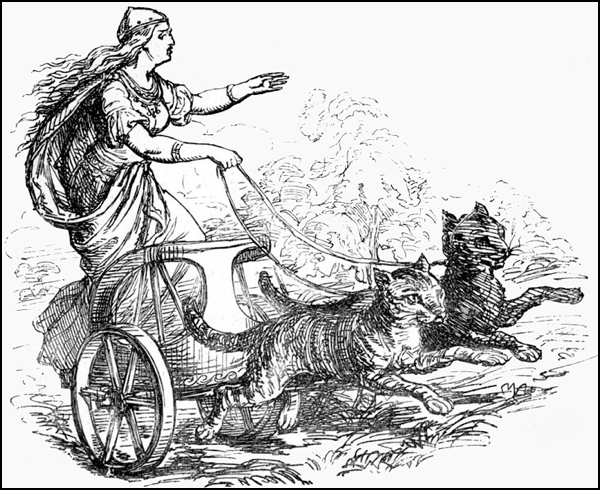 She rode in a chariot pulled by two Norwegian Forest Cats or Skogkatts. 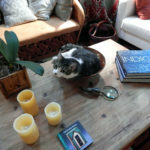 Here’s the photo to prove it, taken on the spot – and the cats look pretty happy about the whole idea. No wonder it’s a myth. I loved the idea of Freya’s cats, though, and my latest piece is called just that, Freya’s Cat. This is a powerful cat, rough-and-ready, able to pull chariots, leap tall buildings, or row boats (should Freya want to travel across a Fjord). This guy carries around a bunch of protective charms, just in case. I think he’s a pretty cool cat. Nice kitty! You light up my life? When you look at the lighted image from the side, the eyes kind of follow you – it really does look rather eerie, but cool. 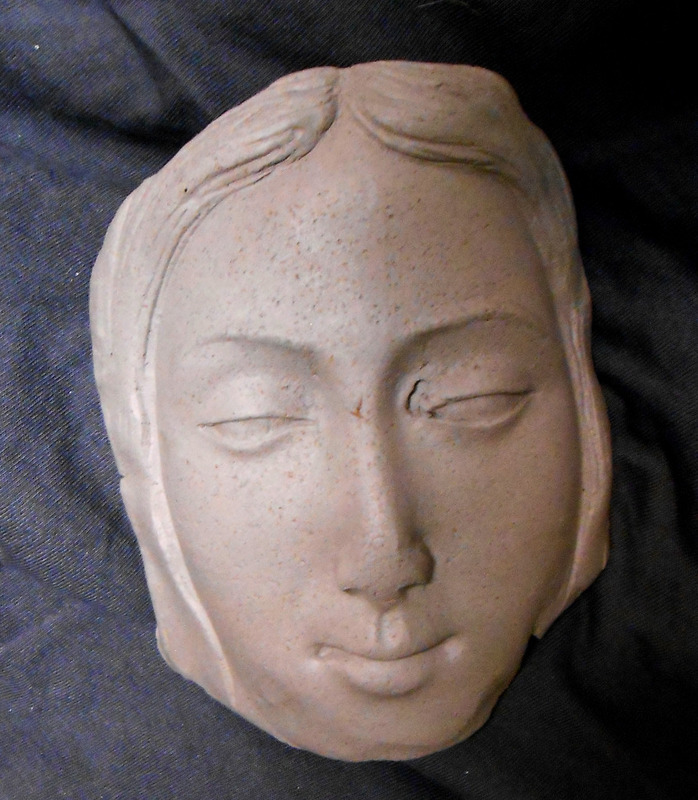 But the *very* coolest part is that I can use it as a Face Shard mold. 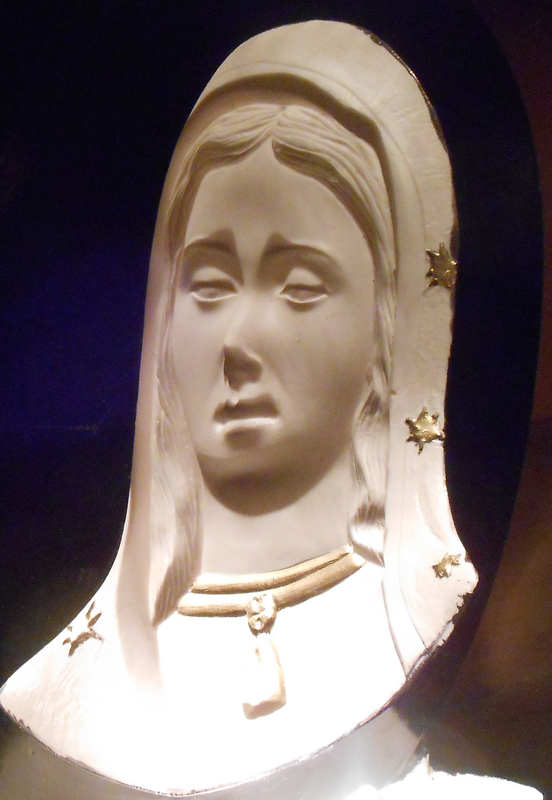 Strangely enough, the face that results from pressing into the shrine (below) doesn’t look a lot like the lighted image! Spooky. 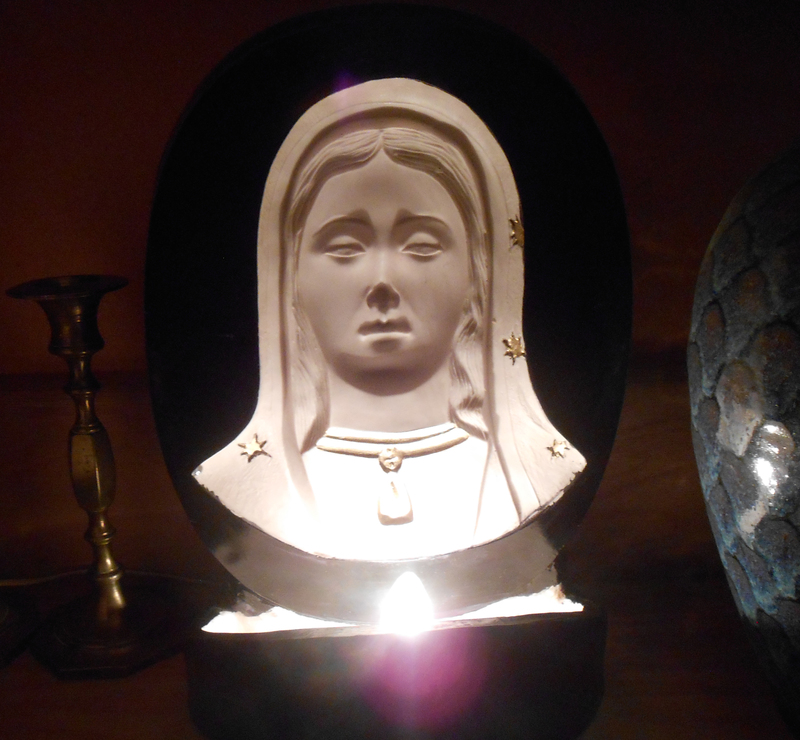 Too bad, though, if you wanted a similar gift – I seem to have gotten the only Light-Up 3-D Illusion Virgin in the whole Mexican Market. You can, however, have a face made from this amazing object if you play your cards right.